Podiatrists. 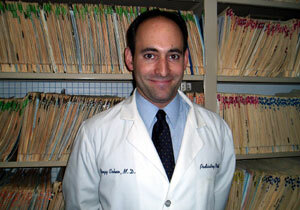 Foot Injuries, Ankle Injuries, Treatment and Surgery. New York, New York. Are you in need of professional, caring, prompt treatment of your painful feet? It has been said many times that "when your feet hurt - you hurt all over". Dr. Sanford Green and Dr. Greg Cohen will take the time to listen, examine, and establish a treatment program to put an end to your foot pain. Do you have questions concerning changes in your foot structure, toenails or the skin on your feet? Bunions, corns, hammertoes and bone spurs can all contribute to changes in the appearance of your feet, to the fit of your shoes, and most importantly to the discomfort you experience when walking. NEW LASER PROCEDURE FOR THE TREATMENT OF CHRONIC TOENAIL FUNGAL INFECTIONS. THE LASER KILLS THE FUNGUS THAT LIVES IN AND UNDER THE TOENAIL! DO NOT HESITATE TO CALL FOR AN APPOINTMENT ! 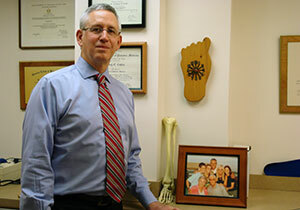 DR. GREEN AND DR. COHEN ARE CARING PODIATRISTS READY TO ANSWER YOUR QUESTIONS AND PROVIDE PROFESSIONAL TREATMENT. *If Any Of These Apply To You – Call Today! Personal Attention in State of the Art Newly Constructed Office. Professional, Prompt, Courteous Treatment of All Foot Problems in Our New Modern Offices. Practice Established in 1982 with Reputation for High Quality, Unhurried Patient Care. Serving the NYC Metropolitan Area. OFFICES CONVIENTLY LOCATED ON MANHATTAN'S UPPER WEST SIDE AND BROOKLYN HEIGHTS.